Fender Play® is the complete learning app for guitar, bass and ukulele. Play your first song in minutes with easy, fun, bite-sized lessons, featuring your favorite songs. o Get Fender Play now and start playing! 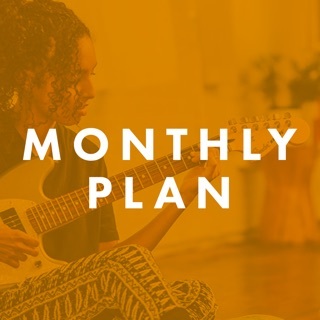 Try out Fender Play FREE for 14 days with a Monthly or Annual plan. Annual plan also includes 10% off Fender products in the U.S. and U.K. Your feedback helped us create a brand-new learning experience. Easy to use and totally immersive, get on your path and start playing! New Path: Step by step, your learning journey is now easier to follow. Personalized Progress: No matter where you left off, see your progress and follow prompts to jump back in and get playing. New navigation: Learn a new song — or try another instrument. It's easy to change your path and find new lessons. Mark as Complete: Ready to skip ahead? Use “Mark as Complete” you'll still get credit for what you know. Immersive Lessons: Focus on playing along more easily with fewer distractions and better views of tabs and chords. This app is great, it’s enjoyable and I love it. But It’s based only on video approach as tutorial lessons. The one thing that will take this app to the next level is a game approach going side by side with the video lessons. Let’s but it in another way, this app is build only of series of video lessons, which gives you the knowledge but doesn’t train you to apply any of it. We need a practice mode that comes after each lesson which is build just like a video game that gives you specific objects that you have to meet in order to accomplish the training session. Objects that you should meet according to a specific requirements by playing your actual guitar while the app is listening and gives you feedback. It will be more efficient and so much more fun. I sincerely urge you to consider this idea. I gave 4 stars to this app, I’m saving to 5th one to the next update, if you actually add game training to it, hopefully. By the way, the teachers are very very nice and I love them all, please give them my best regards. thanks a lot. Good at the start but progresses WAY too fast! I liked this from the start but I am in the second level and the instructors do an absolutely terrible job at informing the viewer of what is coming up next in a chord progression. The tab doesn’t show up so I can’t follow along. It also doesn’t scroll so I can’t play along event Shawn the tab does show up. I can’t even pause to practice because the video control blocks the list of chords. So many things add up to a terrible experience. I wish there was a way that I could play along more easily. The instructors need to pause between chord progressions. You can’t assume everyone can just jump right in and be perfect at it. I will still use this app but it’s really not the experience I wanted. I think o might go back to You Tube. I think I learned at a more steady pace. Frustration. I have thrown my pick down more than once because of how poorly these “instructors” actually instruct. I watched 4 videos in a row on what the strings were called but when it comes to chord progressions they fly right through it. Sad. Hi there - we'd love to get more details from you. Could you email me at jshapiro@fender.com? A lot of my comments from my original review have been addressed, and handled well! I appreciate the reorganization of the lessons, and the effort to put tabs and notation onscreen. Re-editing those videos is not trivial, and it looks like lot of care was taken. Thank you! My only remaining request is for an AppleTV version of this app! I always end up using airplay to put it on my TV and stereo, but it would be a lot nicer to have the whole app run natively there. These are well recorded lessons with a set of good instructors! There are a few awkward points where it seems like lessons might be a little out of sequence, or assumed skill level will jump abruptly during one lesson (looking at you, end of Electric Guitar Level 1), but the concept and the quality is great! 1) Make more use of on-screen graphics! The could be more on-screen tablature or notation for students to follow along with. 2) Make an AppleTV app for this! My wife and I are learning guitar together through these lessons, and right now we have to use Airplay to get it on our TV. This is always a little awkward and it would be much nice to have a native AppleTV app.